Shortly I will be leaving for a photo workshop in Outer Mongolia. When I first travel to a destination I have never been to before, I spend time online checking out images from other photographers in order to get some idea what to expect and to be able to plan ahead for the images I wish to capture. The first thing that occurred to me is the vast open spaces of the Gobi Desert and the Mongolian Steppes. In my mind’s eye, I pictured wide vast panoramas of the distant mountains and isolated gers (tents). In order to properly capture such images, I knew from my research I would need some kind of ‘L’ bracket and offset on my ball head. To best record proper panoramas, the camera should rotate around the nodal (“optical center”) of the lens and not around the camera tripod mount in order to avoid parallax errors. There is a nice commercial device called the Nodal Ninja available for proper panoramas, but these commercial devices can cost up to $400 and more. I needed something that would be easy to pack and carry and affordable. So, I ended up making an ‘L’ bracket and mounted it to an Arca-Swiss style plate intended for a 600-800mm lens (about 6.5 inches long). The Arca-Swiss plate turned out to be easy. I found someone on eBay that sells a 6.5″ Arca-Swiss style mounting bracket for about $27, shipped. That would actually work fine for shooting a panorama with the camera oriented in landscape mode, but ideally the camera should be in portrait mount. So, I would need some kind of ‘L’ bracket that would allow me to mount the camera vertically, rather than horizontally. 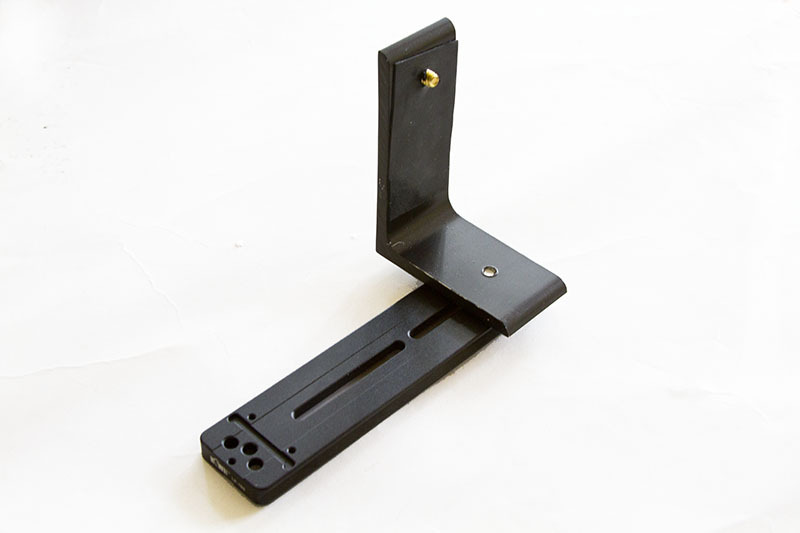 Doing a bit more online research, I found that I could buy an aluminum angle bracket that was 3″ x 4″ from www.onlinemetals.com. They will cut the bracket for you and I only needed a piece that was 1.5″ wide and 1/4″ thick. The price for this piece is about $1.10, but will cost around $10.00 to ship! Please note that after I bought this size bracket I realized it will work fine for my camera without the battery grip, but is too short with the grip. Onlinemetals.com has larger brackets of 6″ x 6″, but they are thicker at .375″. I decided to simply remove my battery grip for doing panoramas, but will later experiment with the 6″ x 6″ angle aluminum. So for a cost of $38, I had the pieces I needed. The Arca-Swiss plate required no modification and could be used as is. For the aluminum angle bracket, I carefully measured two holes and drilled them out. The hole on the 3″ side would need to be tapped for a 1/4-20 thread to screw into the Arca-Swiss plate. This hole should be as close to the center of the lens as possible when the camera is mounted on the 4″ side, vertically. For the 4″ side, I needed a slightly larger hole to be drilled in order to mount the camera with a 1/4-20 screw (to mount via the tripod socket). I also realized that my Canon 5D had to be raised up on the 4″ side in order to permit my remote cables to be connected. I couldn’t turn the camera the other way around so that the connectors were at the top as the 4″ side is too short when the camera is oriented this way. After carefully drilling the holes and tapping the hole on the 3″ side, I filed down the rough edges and then painted the L bracket flat black. Finally, I cut a piece of thin rubber and used super glue to glue it to the 4″ side to protect the base of the camera and to provide a better grip to keep the camera from rotating. The longer Arca-Swiss plate allows the camera to be offset from the rotation point of the ball head, so that the pivot point will be around the lens and not the camera. This point will actually change with different lenses and eventually I may test and mark the Arca-Swiss plate for each of my wide lenses so that I can quickly set it up and be reasonably sure that I’m rotating around the ‘optical center’ of the lens. Finally, all I have to do is stitch the final images together in Photoshop! Keep an eye on The Fotobug fan page and my Flickr page to see results of my little home-made bracket! This entry was posted in DIY, DSLR and tagged DIY, DSLR, L bracket, nodal point, pan, panorama, stitch. Let me know how you make out or if you have any questions! I recently used mine sucessfully in Mongolia! Is the horizonal pivot point the front of the lens or the film plane? That’s a great question, but there is no easy answer! The horizontal pivot point is normally located between the film plane and the front of the lens, but could even lie in front of the lens! For a zoom lens, the actual point will likely vary depending upon the focal length. My little L bracket isn’t designed to perfectly rotate around the exact pivot point. If you need that precision, then I recommend one of the nice commercial models (though expensive!). One quick way to check to see how close you are rotating around the pivot point is to select a nearby object in the scene and one at a greater distance. When you pan, if the two objects stay basically the same orientation to each other, then you are very close to the pivot point! If one appears to move further left or right of the other, then you are still not on the pivot point! Ray, you’re my kind of guy – a finagler who won’t accept the common wisdom or the high cost of engineered perfection! I’m going to have to build one of these contraptions just for the sake of doing it. Looks like a lot of fun.